My baby is gagging on food: should I worry about choking? 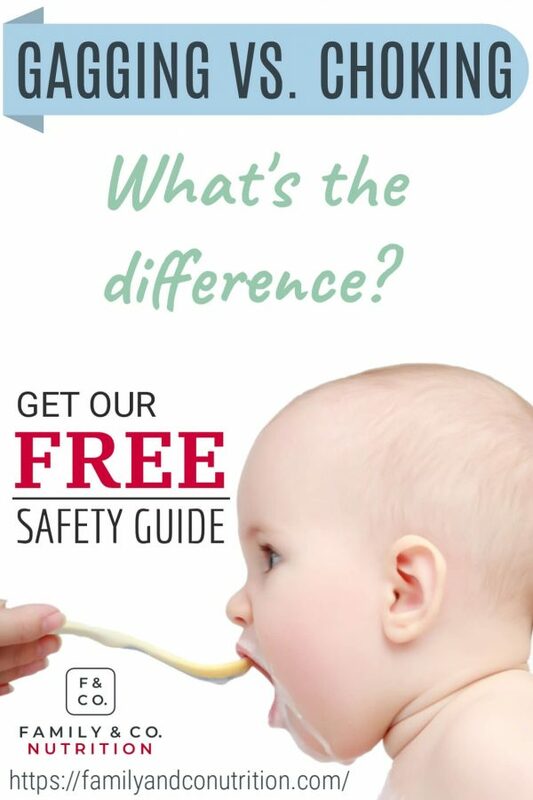 What’s the difference between gagging and choking in babies eating solid foods? Is my baby gagging on food? How can I tell? Why is my baby gagging when eating? Will my baby stop gagging? Gagging and baby-led weaning: is it better than purées? How can I help my baby with sensitive gag reflex? 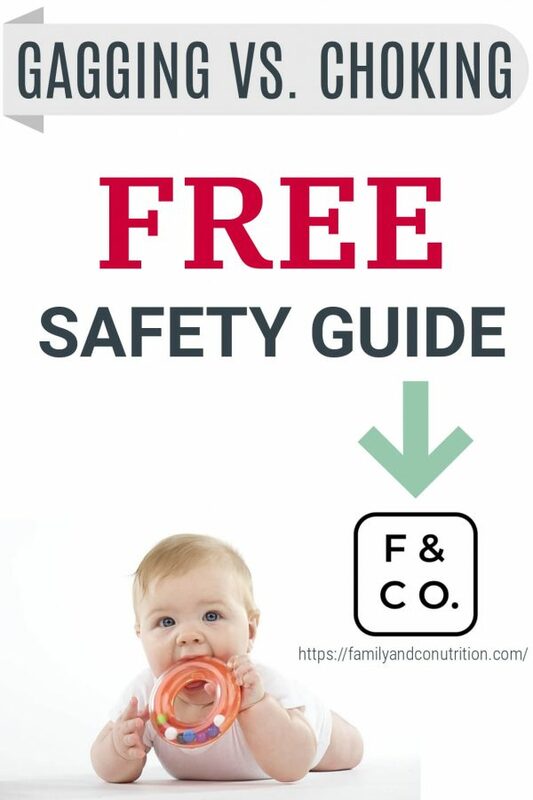 How do I get my baby to eat textured food? Now that your child is eating food, it’s a good idea to learn the difference between gagging and choking in babies. Both situations can be scary. Getting all the information is important so you don’t panic but react wisely. 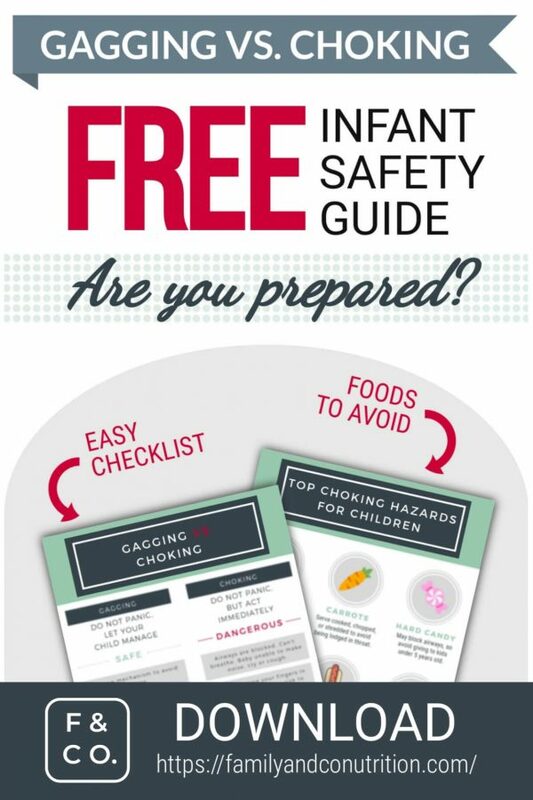 If your baby is gagging on food, it isn’t a sign s/he is gonna choke. And fingers crossed your baby never chokes. Brushing up on your knowledge of gagging and choking can help you stay calm if any of these happen to baby. 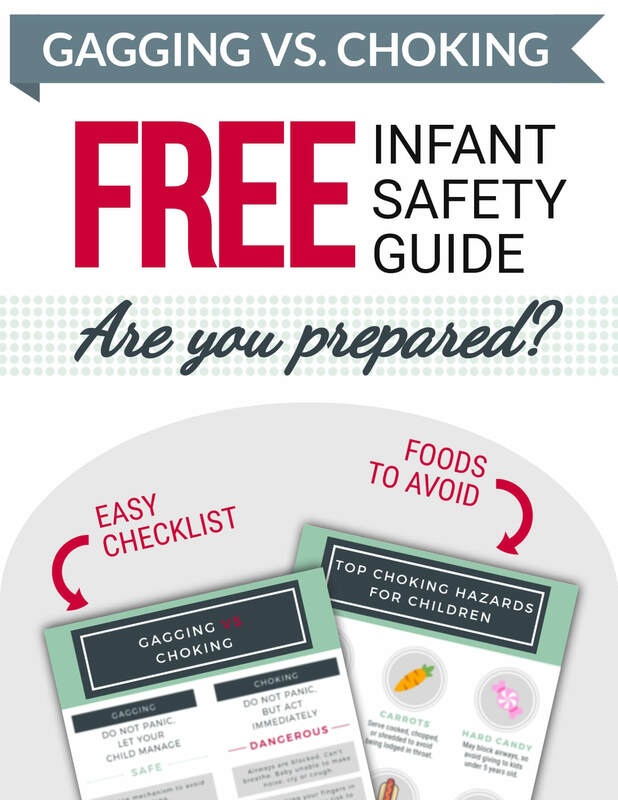 Choking is the most common concern parents have when baby starts eating. 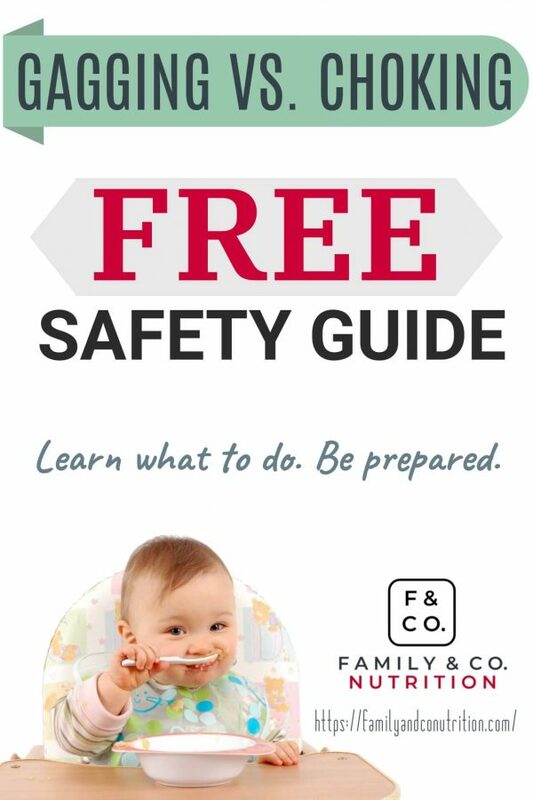 Regardless of how solid foods are introduced (traditional with purées, or baby-led weaning with soft pieces), all children are at risk of choking. Also, all children have a gag reflex. 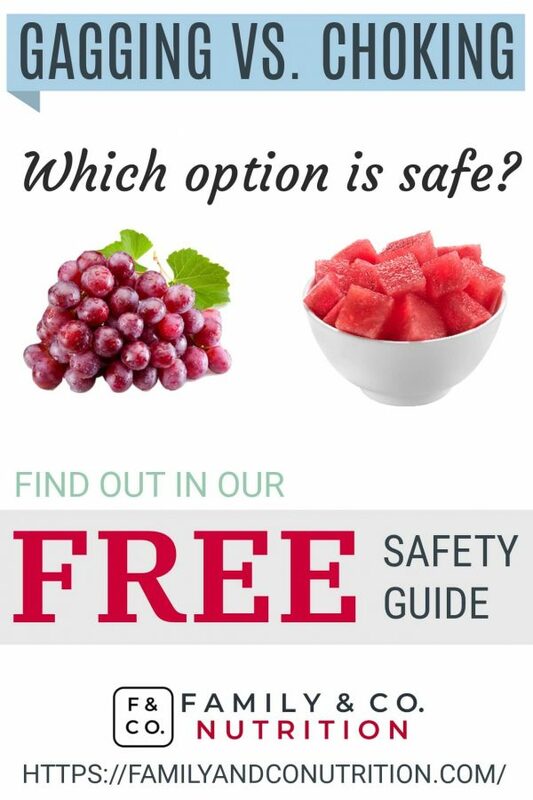 Parents should always offer safe food to prevent choking in babies. Gagging is a good reflex kids have to protect their respiratory tract, and avoid choking. As kids learn to move and manage food inside their mouth, they sometimes gag. The gag reflex, can lead to coughing and sometimes vomiting. It’s a natural reflex that inadvertently prevents swallowing before baby is ready. So, it’s healthy and normal. Gagging is usually loud, and can sound like someone who is about to vomit. Baby can turn red as s/he is forcing to spit out the food. Gagging is a healthy reflex all babies have. It tends to disappear as baby ages. 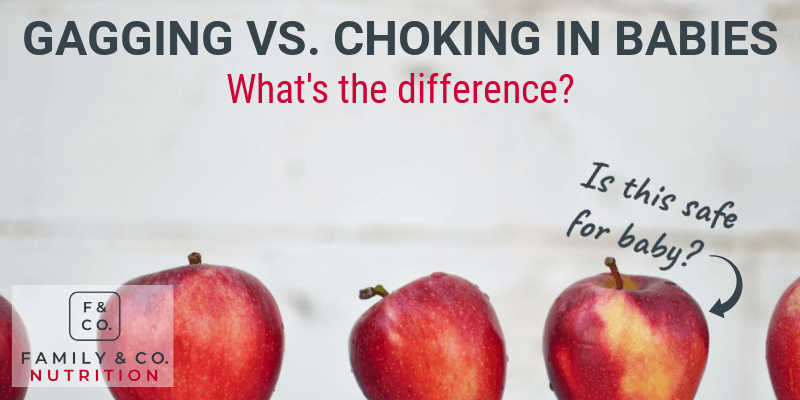 Choking happens when a piece of food (or any other object) blocks the airways. Always supervise your child when eating. Choking is typically silent. Your child might not be able to cry/cough or breathe when choking. Also a good idea to know what to do in this case – a CPR course is the best way to feel ready. Choking is dangerous and requires to act right away. Here’s a great video on choking and first aid. Although we encourage you to follow a course yourself on CRP. When food touches the back of baby’s tongue it triggers the gag reflex. In younger babies, the reflex is further forward on the tongue, triggering the gag reflex more easily and often. It is a normal reflex to gag, and as baby explore and learn to eat, the reflex becomes less sensitive. Based on reports, babies on average lose the sensitivity of their gag reflex by 8 months old. Some kids will keep a more or less sensitive gagging reflex as adults. It should not interfere with their ability to eat. Keep in mind that this can vary widely between babies. When baby is gagging, it is best to stay calm. Try to avoid touching baby. Don’t pat their back as it could disrupt the protective effect of the gag. Instead, you can gently say “It’s okay, you can cough”, or “Well done” so that baby knows that this natural reflex is protective, and there is nothing to worry about. You can also explain to baby what happened. Did baby put his/her fingers too deep? Did baby take a large bite that was too much to manage? Different things can trigger the gag reflex, which is what baby is learning. If you worry that your baby gags too much or too often, seek out help. Some exercises can improve the development of your child, and reassure you as a parent. Gagging is normal, but as babies learn to eat and mature, they will lose their prominent gag reflex. Recent research compiled evidence from the few studies that have looked at baby-led weaning practices vs. traditional purée feeding. There are not a lot of studies yet. In terms of choking, when self-reported by parents, there was no difference between babies doing baby-led weaning vs. purées. Let’s keep in mind that choking is a difficult behaviour to measure. It is self-reported by parents, who may not remember everything. Also, some parents might confuse gagging and choking. But what is even more important is that choking was estimated to occur in 35% of all babies, no matter the feeding method. 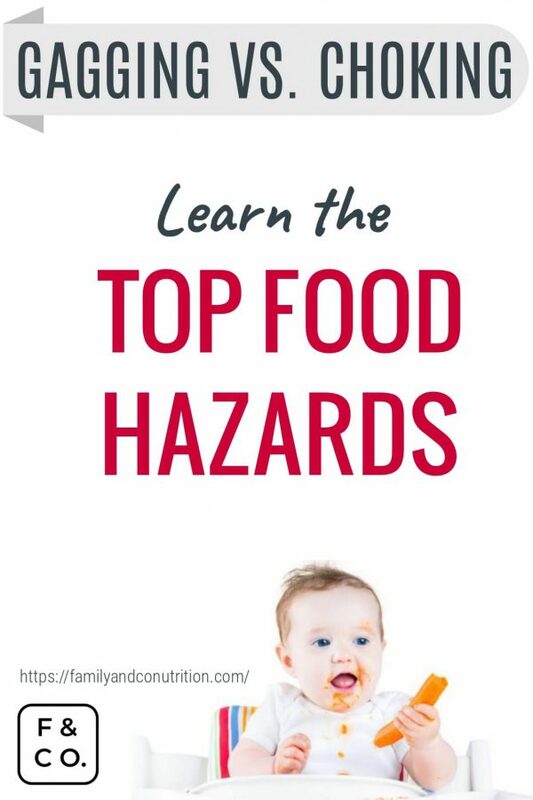 Baby-led weaning or purées, babies are all at risk of choking. The feeding method did not make a difference. The top 3 foods baby choked on were apple slices, crackers, and sausages. 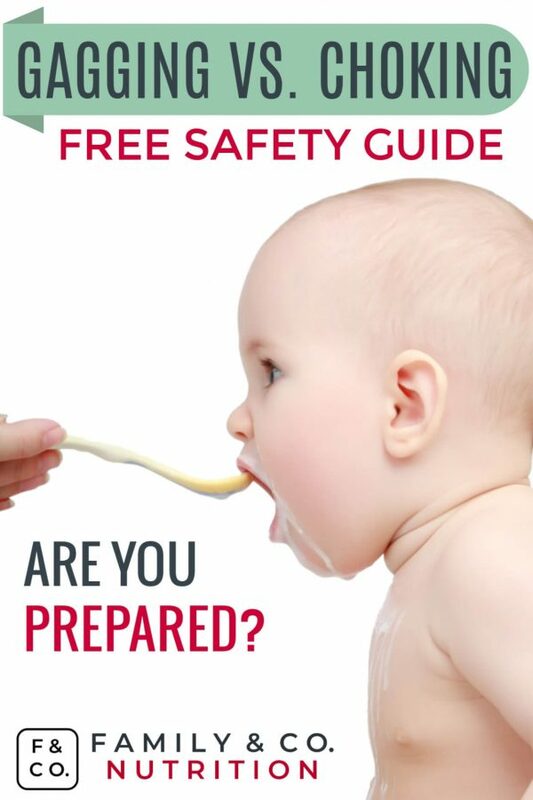 Adopting safe feeding practices is key in preventing choking in babies. For babies with a very sensitive gag reflex, you can offer smaller pieces of food and smaller bites. With time and experience, babies tend to lose the sensitivity of their gag reflex. If you baby tends to take big bites that make him/her gag, offer less food at a time. This will prevent baby from putting all the available food in his/her mouth. As baby grows and gain experience eating, s/he will lose the sensitivity of the gag reflex. At first, your baby might only eat puréed food; however, slowly transitioning to solid foods is important. Offer mashed food, purées with chunks, or grossly puréed food. Try different foods even if seeing your baby gag/refuse food is discouraging. All of this is part of learning to eat. Use a mesh feeder bag in complement to other foods. This will offer baby different ways to build their eating skills. Offer food that is only one texture. For example a thick soup (one texture) rather than a chunky soup (multiple textures). Practice brushing your baby’s teeth. It helps get baby more comfortable with “stuff” in their mouth. It is not recommended to only offer smooth purées, and hope baby will grow and improve. Talk to your doctor if you have concerns or feel your baby isn’t progressing well. Let baby lead the way. Putting fingers in your baby’s mouth can push food further down and increase choking risk. This may surprise baby and fall straight in the back of their mouth and lead to choking. Letting baby grasp and feed himself/herself ensures that baby expects food and is ready to manage it. Aim for a straight back at 90-degrees with their seat. This ensures that baby can support his/her upper body and head, while having the ability to move the head down to gag and spit out food as needed. Visit this post to read on signs of readiness to start solid foods. Sit with your child and observe. Gagging is often loud and you can hear it. Choking is silent: baby doesn’t have air and won’t produce a noise to warn you and ask for help. So, refrain from doing the dishes, using the washroom… sit down with baby. It also fosters family meals which has many advantages! More here on best practices during family meal time. The key is to let baby lead, and take the time to sit down. Avoid offering foods that are small and round, hard, sticky, or crunchy until your child is 4 years. For at-risk food, offer them in a safe way. Avoid foods that are small and round, hard, sticky, or crunchy until 4 years of age. Always feed your child when sitting properly at the dinner table: Not in a moving car, not in a rolling stroller, not while she is playing/walking/running. Avoid distractions at the dining table: avoid screens, games, and anything that can make your kid laugh while eating. A calm atmosphere is suitable so kids are fully in control of their actions. We want them to concentrate on eating. After all, they are learning a new skill. Know what to do if choking happens. Refresh your CPR skills. Remember that choking can also happen with toys and objects your child will find and place in his mouth. Scan your house for tempting objects your kid will likely wanna put in his mouth. Choking risks exist with food and toys. Refreshing your CPR skills might be a good idea. Print this reminder and post it on your fridge so that everyone feeding your child know how to react with gagging and choking. Also, a good idea to put this on the grandparents fridge too! Avoid honey until your child is 12 months-old. That goes for all honey: raw, pasteurized, cooked, in recipes, or in prepared food. This had nothing to do with choking, but it is to prevent infant botulism. Your child’s immune system is still unable to fight that bacteria, so it is better to avoid honey completely. Thanks for reading, and if you have any questions you can always comment below, or reach out to at the contact page.